Waking up early in the morning can be a nightmare. While some of you might disagree, most of you would agree that getting up from bed in the morning is the most difficult, next to impossible, task to do. Well, it would’ve been easier if they didn’t invent that ‘snooze’ button. All you need to do is to hit the button and alarm goes silent for a designated time period. Soon enough your mind develops a habit and you’ll be snoozing alarm all day long without disturbing your sleep. Meet our young inventor, Sankalp Sinha- a 19 year old university student- who was facing the same problem. The young Indian genius was missing his university lectures because he was unable to get up in the morning on time. That snooze button was ruining his life, so he sat down and put his mind to work and viola; an idea. He invented a unique alarm clock that gives you a little something when you try snoozing it; an electric shock. Morning classes at the university were becoming a problem for our young Indian and that’s exactly when he came up with this brilliant idea a couple years ago. He too was a victim of annoying habit; hit the snooze button and go back to sleep. The key idea or purpose for his alarm clock was to force the person out of bed somehow. What better way than zapping him with a bit of electricity shock to get his brain started! Mr. Sankalp Sinha, student of Automobile Engineering at Sharda University in Uttar Pradesh, finally found the solution to his problem; an alarm clock that delivers a small electric shock when you hit the snooze button. The young inventor says, ‘The shock it administers is harmless but is enough to energize you’. He also said that the users would be able to adjust the power of the shock. The clock is known as Good Morning Sing n Shock clock. The power of this clock is a fraction of the 50,000 volts that can be delivered by a Taser gun (standard). It is weak, but that’s for your own safety; you want to get up, not get taken down by your clock. 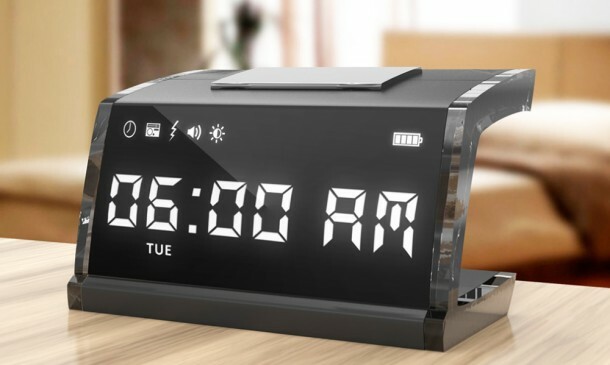 The current is transferred via the Aluminum coated snooze button and the inventor is quite sure that even the deep sleep users will not be able to ignore the wake up call. He also said; ’I think it will help a lot of people who have the same problem as I do’. He is currently negotiating with a number of manufacturers to get his idea into the production for commercialization. If he is successful, it would be available for $100. The idea, for sure, is innovative, and a bit of fun! You could always gift one such clock to your siblings or friends and then wait for their shocked scream in the morning. It’s always good to see such young minds coming up with such brilliant ideas.